'Twas a time not so long ago when backing up an Android phone was a massive, migraine-inducing undertaking. It's true: A mere matter of years back in our mobile device saga, a proper Android backup required physical computer connections, complicated third-party software and more than a few adult beverages. But my, what a difference a few years makes. These days, backing up an Android device and keeping your data synced takes little to no actual effort. Most of the work happens seamlessly and automatically, behind the scenes — either without any involvement on your behalf or with a one-time opt-in when you first set your phone up. And restoring your data is typically as simple as signing into a device and letting Google's systems work their magic. Still, your data is important, especially if you use your phone for business. With all the stuff we tend to have on our phones (or at least accessible from our phones), it's worthwhile to know where and how everything's being saved. That way, you can understand what's happening and confirm it's all functioning as intended — and the next time you need to move to a new device, you can rest easy knowing your data will be there and ready. 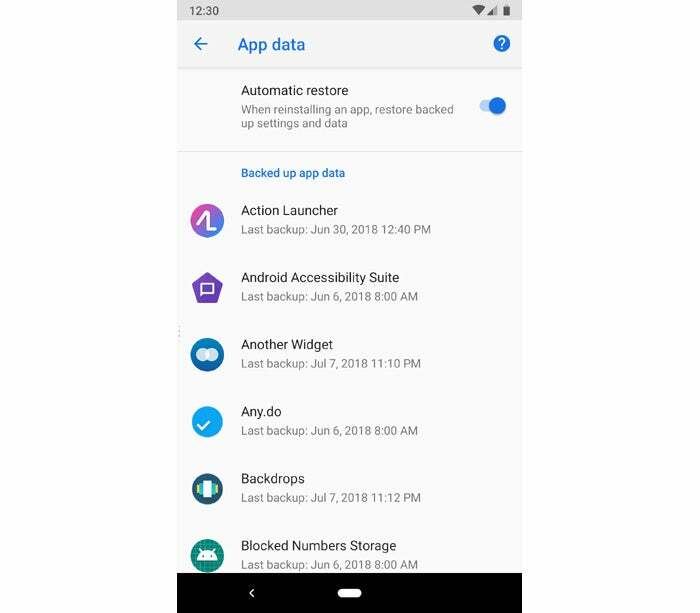 Here's a section-by-section breakdown of Android's backup systems and how they operate. When you powered up your Android device for the first time, you probably signed in with your primary Google account. This is critical — because that same account is your key to the vast majority of your automatically backed up data. On the system level, that includes many of your Android settings and preferences, ranging from approved Wi-Fi networks and passwords to your language and input settings, date and time settings and display preferences. You should see an active toggle next to "Back up to Google Drive" at the top of that screen, and below that, you'll see the Google account that's associated with all of your system backups. Make sure you use that same account when signing into any devices in the future — and if you ever need to change which account is associated with your backups, just tap the line showing the account on this screen; that'll bring up a list of all the Google accounts connected to your phone, and you can select whichever one you want to take over. Android has a tool for you to monitor and confirm your system-level backup status. Lower on that same screen, meanwhile, you'll see a section labeled "Device settings" that'll tell you exactly when your settings and preferences were last backed up. 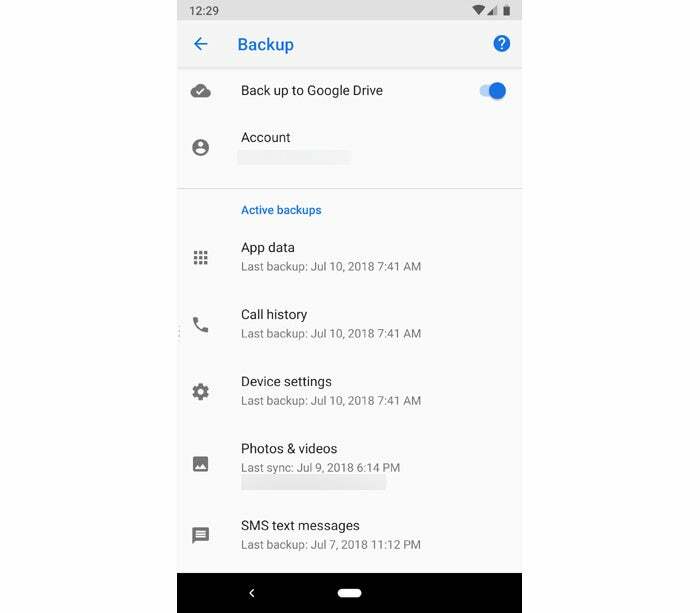 You can also look in the "Backups" section of Google Drive on the web to find this same information and see precisely how much space is being taken up by your backed up settings for any devices associated with your account. The list of apps you've installed from the Play Store is always synced with Google's servers, and when you first sign into any new Android device, you'll be given the opportunity to restore that complete set of applications or to cherry-pick certain titles from within the list. If you've had more than one Android device active on your account recently, you'll be able to choose which device you want to use as the source. For devices running 2015's Android 6.0 Marshmallow release and higher, Google provides an expanded app backup system that also saves and restores app-specific data — everything from sign-ins to preferences and any other relevant elements. It's worth noting that this requires some level of integration and support on the developers' behalves, however, so it works more effectively with some apps than others. You can see which apps are backing up data and when the backups were last performed by heading into that same "Backup" section of your system settings and tapping the "App data" line. There, you'll also see a toggle that instructs Android to automatically restore any backed up settings and data from an app whenever it's reinstalled. Your phone can automatically back up and restore app-specific data. Backing up these business-critical areas is actually quite easy — because nowadays, almost all calendar, contact and email data is inherently cloud-based (or at the very least cloud-connected). In other words, you don't have to back up your phone's email or calendar data because it's already stored in the cloud; you can simply open the email or calendar app from another device to retrieve it. The one asterisk worth mentioning is contacts, as some manufacturers and even carriers provide their own interfaces for organizing contact information — and those interfaces don't always sync with Google's Contacts system by default. Suffice it to say, this isn't ideal: If your data is set to sync with, say, Verizon's system instead of Google's, you'll be in a pickle if you ever try to sign into a non-Verizon phone in the future. Similarly, if your contact data is being stored only on the device's local storage or SIM card by default, you're asking for trouble down the line. Go into your phone's Contacts app and look in its settings to see if there's any option for where your contacts are being synced or stored. The specifics vary from one device to the next, depending on the manufacturer and carrier — but often, when a company puts its own solution in place of Google's, it'll give you the ability to switch to Google's Contacts system if you want. Some phones' Contacts apps may also ask where you want to store a contact every time you add someone new. Be sure to always select Google for maximum consistency and accessibility moving forward. The Contacts app on many Samsung phones asks where you want to save a new contact every time you create one. You can confirm that your contacts are, in fact, being synced with Google Contacts in that same aforementioned "App data" section within "Backup" in your system settings. You can also always access Google Contacts via its dedicated website to see that your data is there. If you lose your Android phone or decide to move to another, there's a decent chance your existing text messages will vanish into the digital ether. That might be fine (and hey, who knows, maybe even a positive thing), but if you do want to back up and save your SMS data, it's pretty painless to do. The simplest way is to use a messaging app that does all the heavy lifting for you. If you have one of Google's Pixel phones, Google's own free Android Messages app will automatically back up some of your messages — up to 25MB worth, according to Google, and only SMS texts (not MMS media messages). It's preinstalled as the default messaging app on your device, so you don't have to do anything to get it up and running. 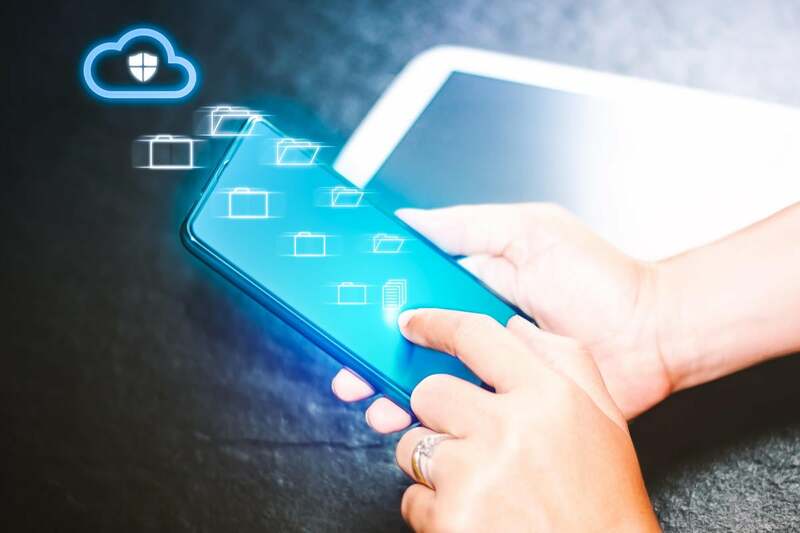 There are also third-party utilities like SyncTech's free SMS Backup & Restore that can manually back up and restore SMS data, but using a messaging app that handles that task continuously and seamlessly is the simpler and more effective way to go. The easiest way to keep files on your device backed up is to save them directly to a cloud-based storage service like Dropbox, Google Drive or Microsoft OneDrive. All of those services provide a reasonable amount of free storage — with additional space available for a nominal monthly or annual fee — and all of them make it simple to access files from your device whether you're online or not. 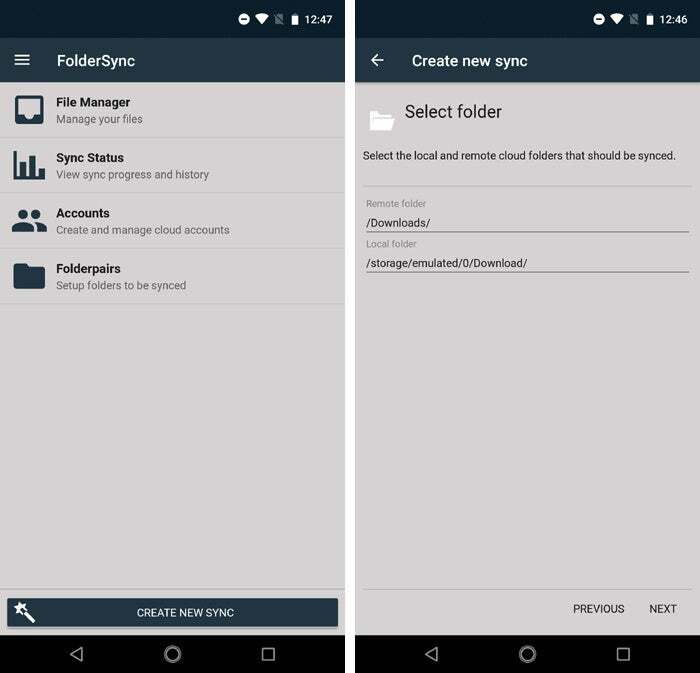 If you'd rather store files locally on your Android phone, snag a $3 app called FolderSync Pro. It'll let you continuously sync folders on your phone with matching folders on a cloud storage service of your choice — and once you set it up, you'll never have to think about it again. FolderSync Pro supports practically every storage service imaginable and can even work with your own personal or corporate server space. FolderSync allows you to keep specific local folders continuously synced with cloud-based equivalents. OK, so they aren't technically work-related — but even if you use a business-connected phone, odds are you're taking some pictures and listening to the occasional hackle-soothing jam. Thankfully, keeping your photos and music backed up is a fairly thought-free process at this point. On the photos front, Google's free Google Photos app will automatically sync every image and video you take and make it available on any other device — mobile or otherwise. If streaming's your thing, of course, just download the appropriate app for whatever service you prefer and listen away without worry.